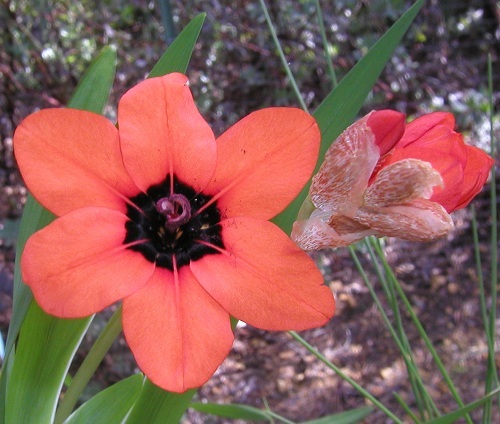 Sparaxis is a genus of fifteen species in the Iridaceae family that is endemic to South Africa and found mostly in the southwestern Cape and the western Karoo mostly on clay soils in the renosterveld, but sometimes in coastal sandveld. 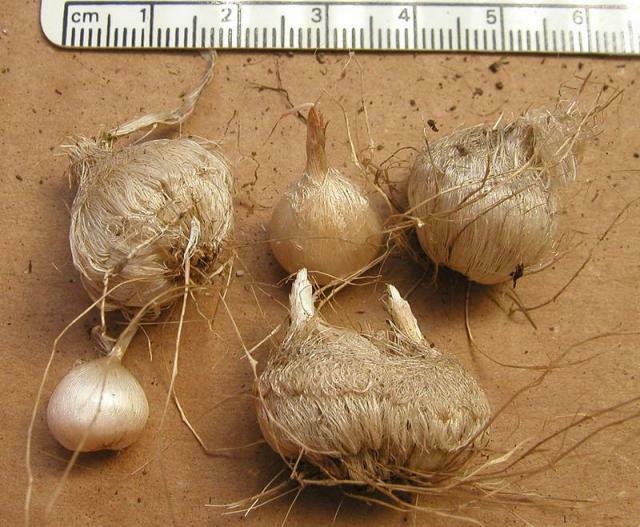 The rootstock is a corm that roots from the base with a pale tunic that has fine to coarse fibers. Many of the species and colorful hybrids have been in cultivation for a number of years and are easy to grow in Mediterranean climates. 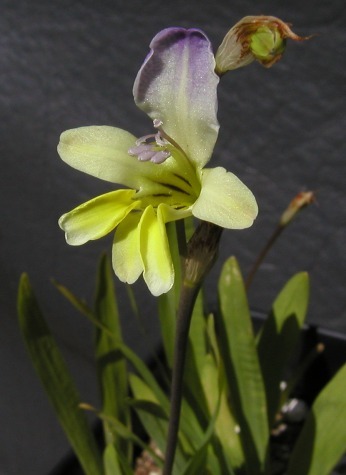 The genus Synnotia is now included in this genus. 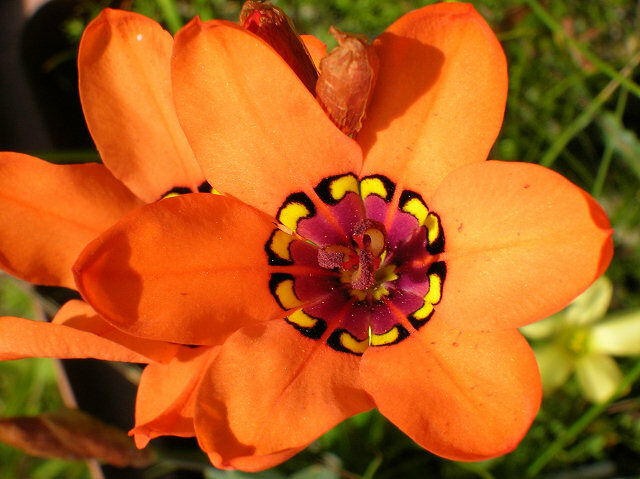 Sparaxis can become virused. 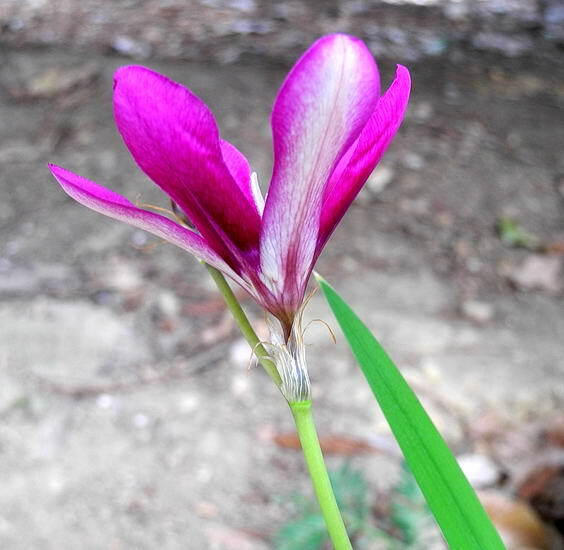 Plants may continue to bloom, but there can be a color break in the petals. There are photos on our wiki Virus page that illustrate this problem. If more than one species is grown in a garden, unusual combinations of colors can result from open pollination by insects. 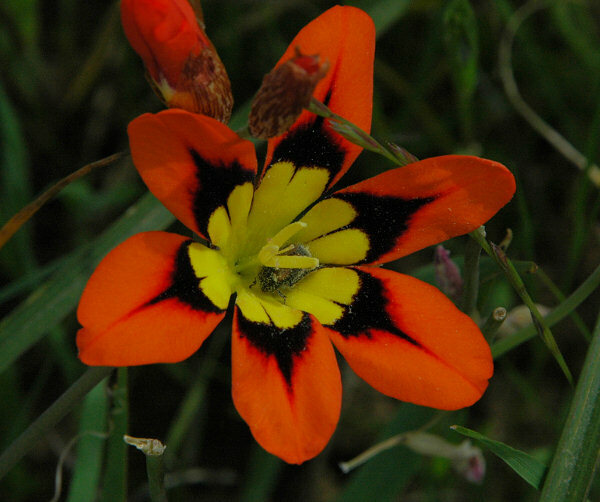 Illustrations of hybrids can be found on our Sparaxis Hybrids wiki page. 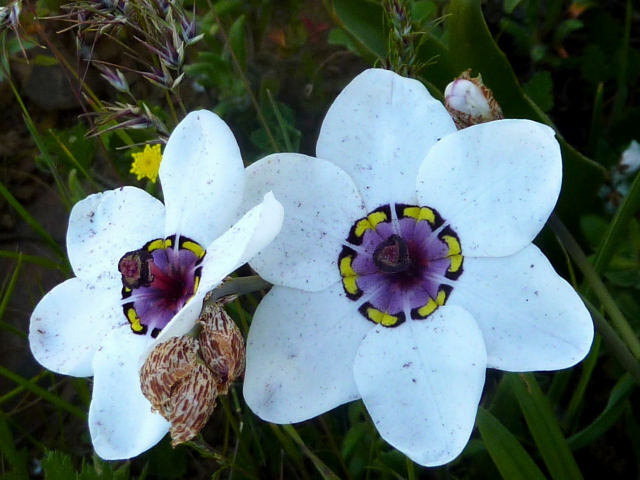 Sparaxis auriculata Goldblatt & J.C.Manning is known from three locations among rocks and in cleared places on bush-covered, sandstone slopes southeast of Vanrhynsdorp at the base of the Gifberg and Matsikamma mountains in the Southwest Cape. It is threatened by habitat loss to the expansion of rooibos tea and tomato cultivation. Plants grow from 15 to 40 cm high and there are mostly 5 to 7 bilaterally symmetrical flowers per spike. 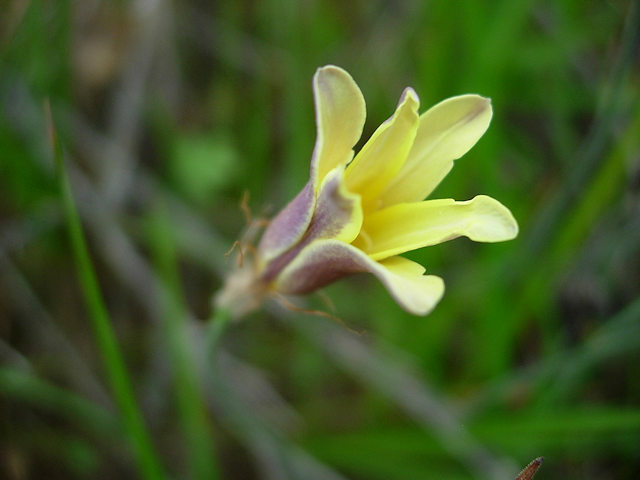 The unscented flowers are cream colored with the dorsal tepal pale mauve, and the lower tepals deep yellow fading to cream; half of the throat is lined grey-purple. 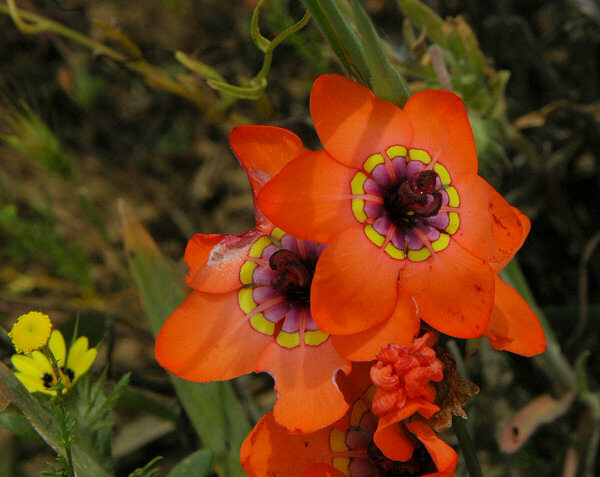 The flowers of this species resemble Sparaxis villosa, but are larger and have a longer style with the branches exceeding the anthers. The leaves and corms are also different. 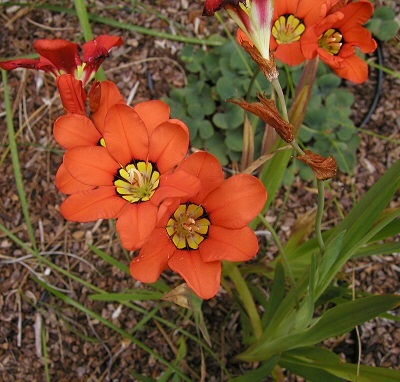 The corms are narrowly conical and have tunics of medium-textured fibers like the corms of Sparaxis galeata and Sparaxis roxburghii, both Northwest Cape species with different flowers. Leaves are distinctive as blades have a prominent submarginal vein that makes the margins appear thickened and the leaf sheaths are speckled with dark purple. Flowering occurs in August. 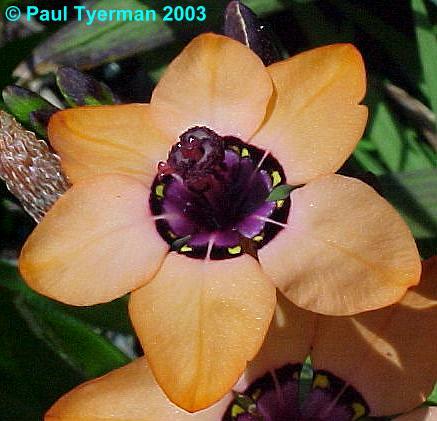 Sparaxis bulbifera (L.) Ker Gawl. 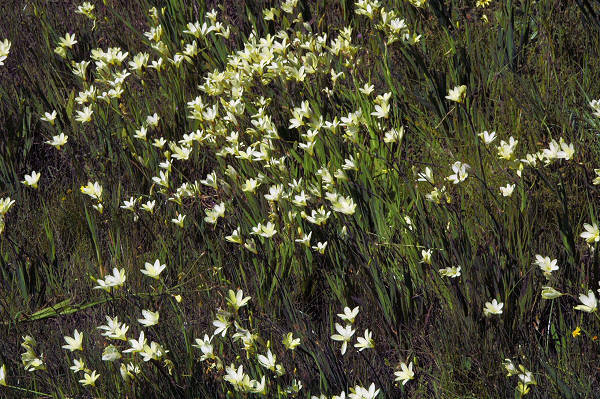 is found on wet sandy or limestone flats in the soutwestern Cape and the Agulhas Plain. 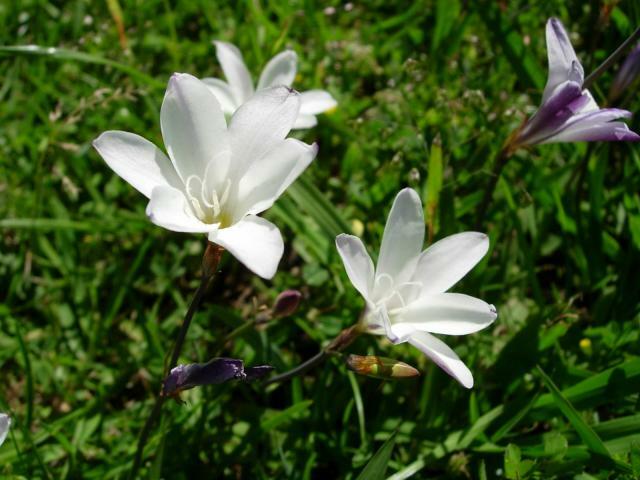 Growing from 15 to 45 cm high, it has branched stems, lanceolate leaves, and two to five white to cream unscented flowers with a pale yellow center per spike. It flowers from September to October. 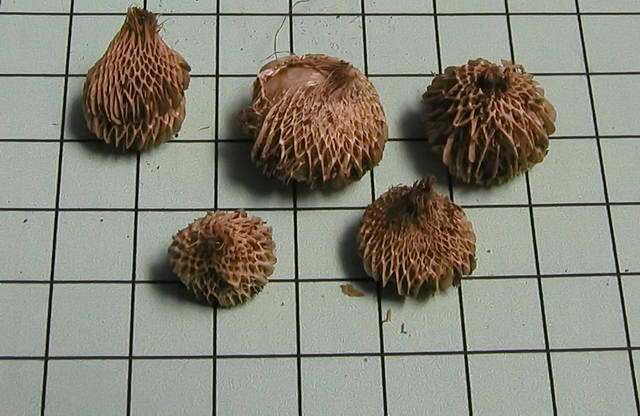 A distinctive feature of this species that reflects its name is the numerous cormels that grow in the stems. 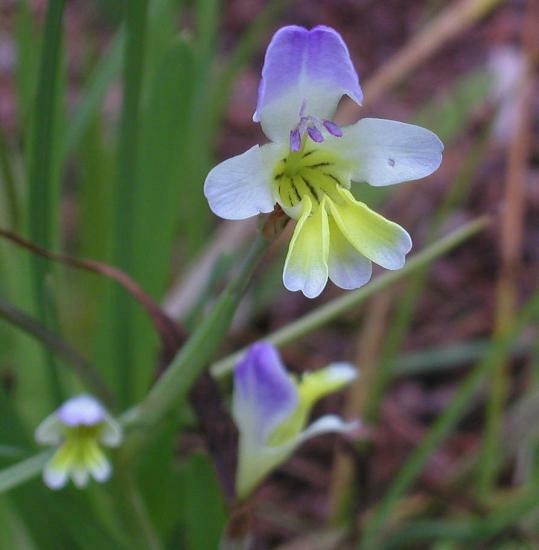 It is one of the few species native to sandy, waterlogged soils. Photos 1-2 were taken by Bob Rutemoeller. Photos 3-6 were taken September 2006 in the West Coast area of South Africa on the way to Darling by Mary Sue Ittner and Bob Rutemoeller. The first population we saw blooming in mass had white flowers and the second population had flowers that were yellow and white. 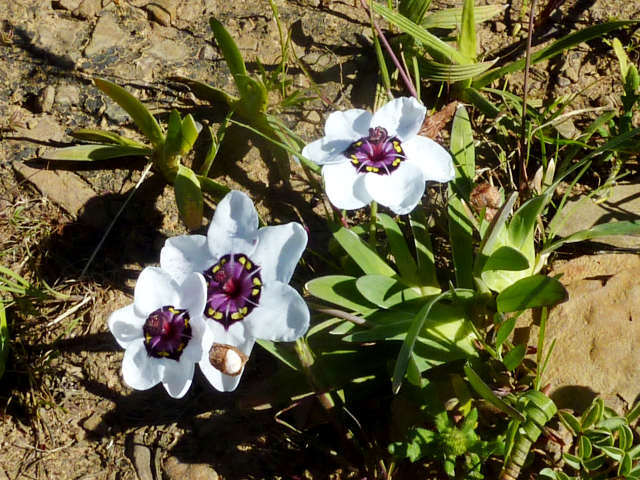 Sparaxis calcicola Goldblatt & J.C.Manning is restricted to seasonally damp places in rocky limestone hills and coast north and west of Saldanha Bay in the Southwestern Cape. Plants grow from 12 to 22 cm and flower from early August to mid September. 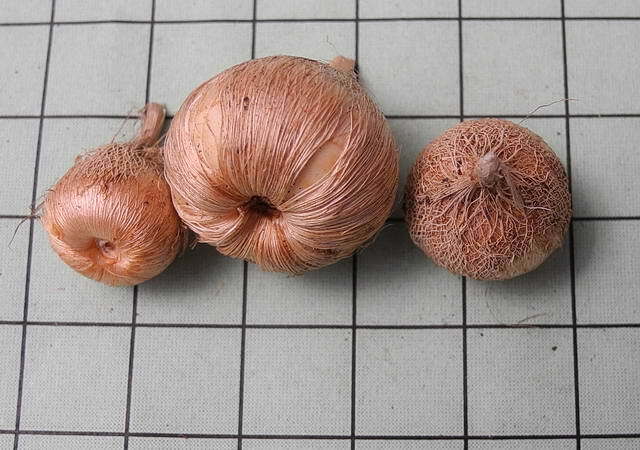 Corms have tunics of fine, netted fibers. 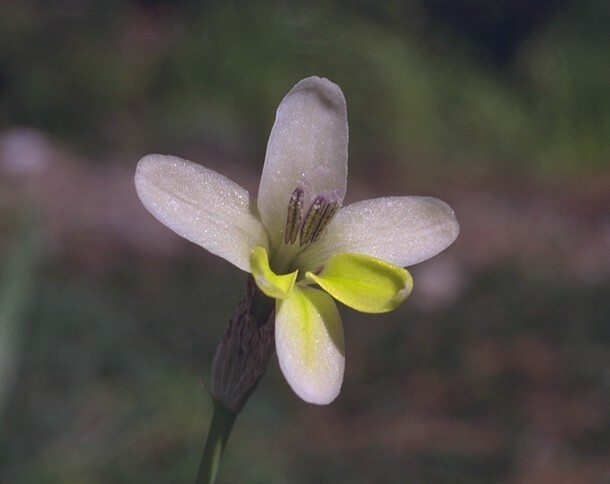 The lightly lemon scented flowers are bilaterally symmetrical with creamy white upper tepals and a suberect larger dorsal tepal and yellow lower tepals with dark marks at the limb base. The upper laterals spread at right angles to the tube and the lower tepals are united, narrowed at the base into claws. This species is threatened by ongoing habitat loss to coastal development and by competition from alien invasive plants. Photos by Cameron McMaster taken near Jacobsbaai. 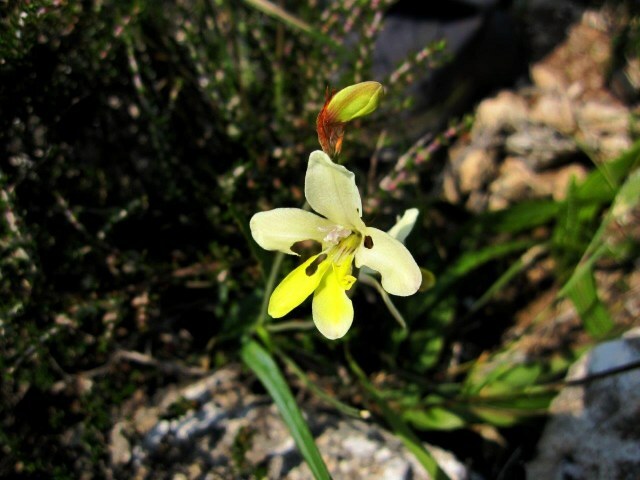 Sparaxis caryophyllacea Goldblatt is endemic of the Nardouw Mountains in the lower Olifants River valley where it occurs on rocky slopes and flowers from mid August to mid September. Growing from 12 to 30 cm, it has corms with tunics of hard coarse fibers thickened into vertical claw-like ribs below and broadly lanceolate leaves that are mostly prostrate and speckled basally. 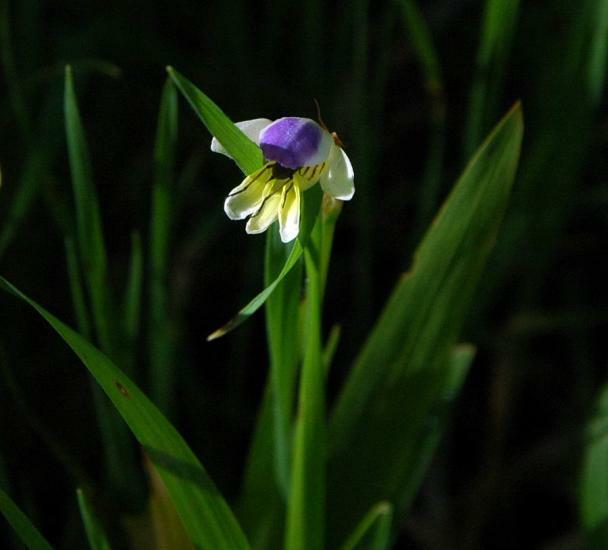 Flowers are sweetly fragrant, bilaterally symmetrical, pale yellow with the upper erect, larger and slightly hooded tepal shading to violet above and the lateral upper tepals cream colored and lower tepals deep yellow. The throat is yellow with dark streaks. 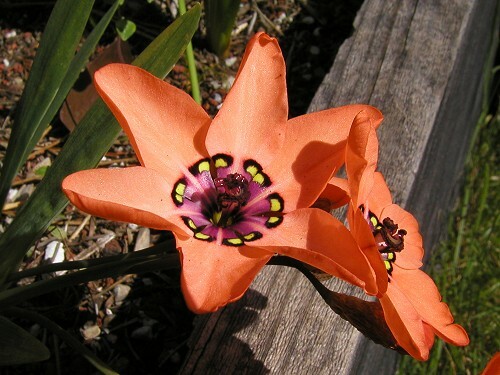 It is similar to Sparaxis villosa but has larger fragrant flowers with a wide speckled throat and speckled leaf bases. 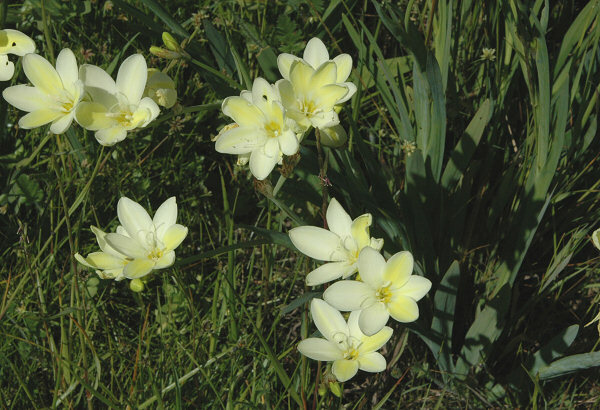 Sparaxis elegans (Sweet) Goldblatt is endemic to the Bokkeveld Plateau where it grows on light to heavy clay soils and flowers from late August to mid September. 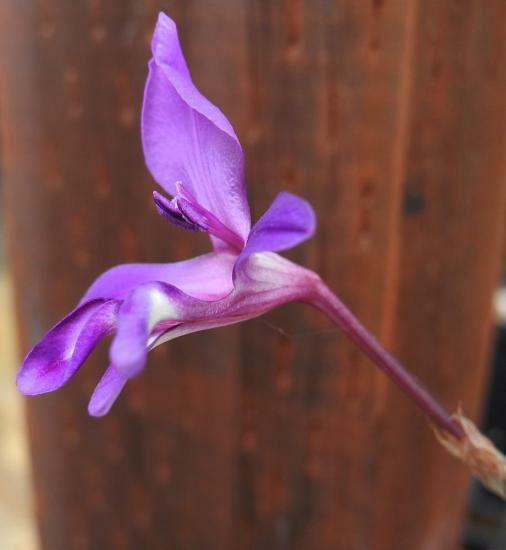 Plants are 10 to 30 cm high and the unscented flowers are radially symmetrical, salmon-orange to pink, or white with a purple tube and each tepal marked near the base with a broken black band. The band often has 2 yellow streaks at the edges. 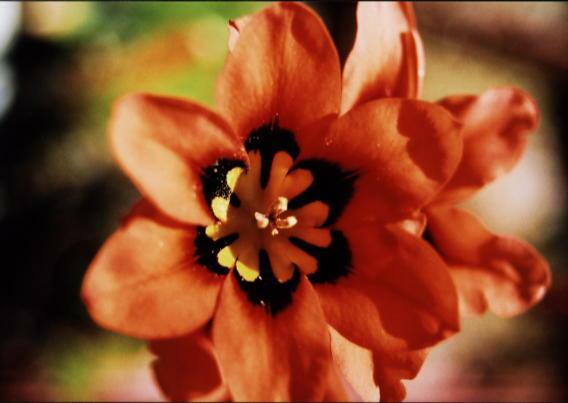 The brown to dark red anthers are coiled and twisted around the style. The first two photos were taken by Bob Rutemoeller, the third by Paul Tyerman and the next two by Alan Horstmann. 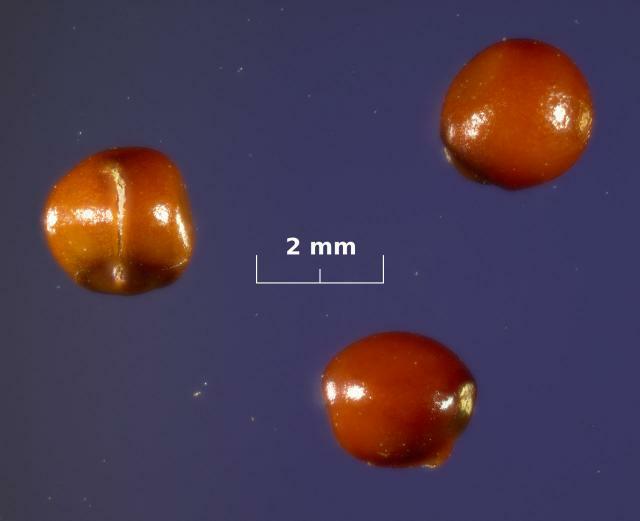 The first two photos were taken by Cameron McMaster and the last, a photo of the corms on a 1 cm grid, by Mary Sue Ittner. Seen blooming near Nieuwoudtville September 2006, the first five pictures below were taken by Bob Rutemoeller and Mary Sue Ittner. 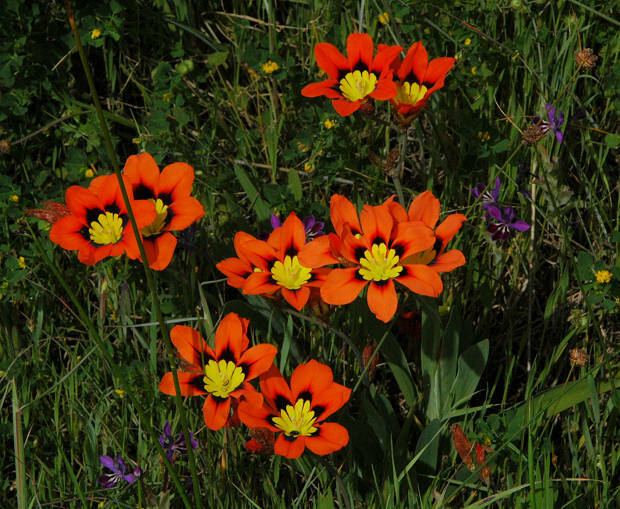 They show a number of them blooming next to the road with close-ups showing a pollinator and the detail of the flowers. 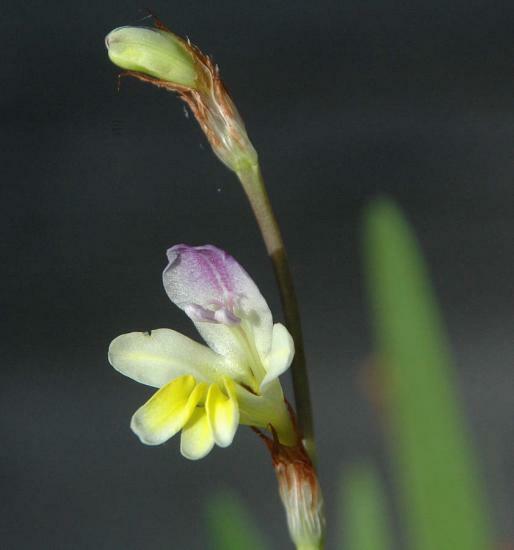 The next to the last picture shows a plant with different coloring in the same population and the last shows a group mixed with Geissorhiza splendidissima blooming at the same time. The first picture of a rare white form was taken by Ragnhild Crawford near Papkuilsfontein in September 2006. The second photo was taken by Andrew Harvie in the Oorlogskloof Nature Reserve. The last two photos were taken by Cameron McMaster at the Biekoes Farm near Nieuwoudtville September 2011. 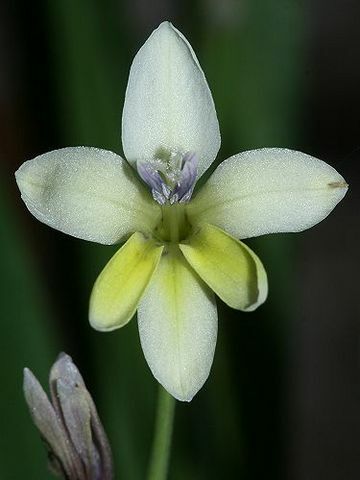 Sparaxis fragrans (Jacq.) Ker Gawl. 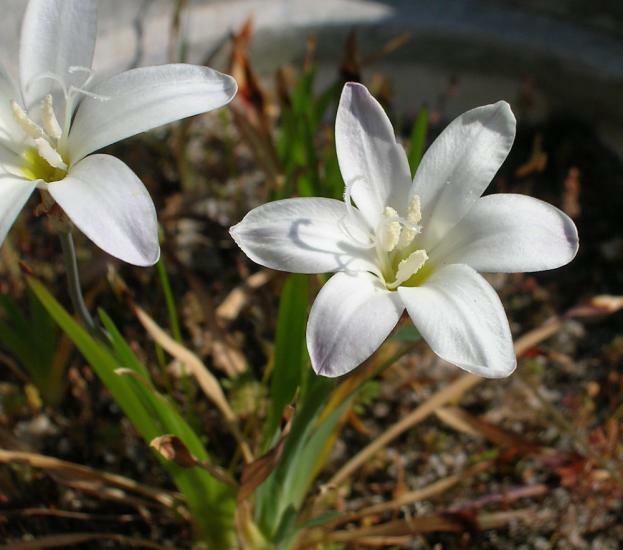 is found on clay slopes and flats that are usually waterlogged in winter in the Caledon district of the Southwestern Cape. Growing from 10 to 25 cm high, this species has yellow to buff radially symmetrical unpleasant smelling flowers that are often mauve on the back and narrow acute leaves. 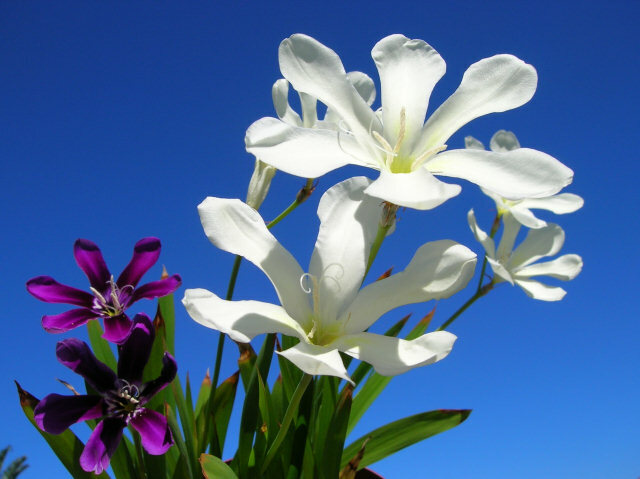 Flowering occurs late winter to early spring (mid August into September). The first photo taken by Cameron McMaster near Caledon in the Overberg. The second photo from Rachel Saunders. 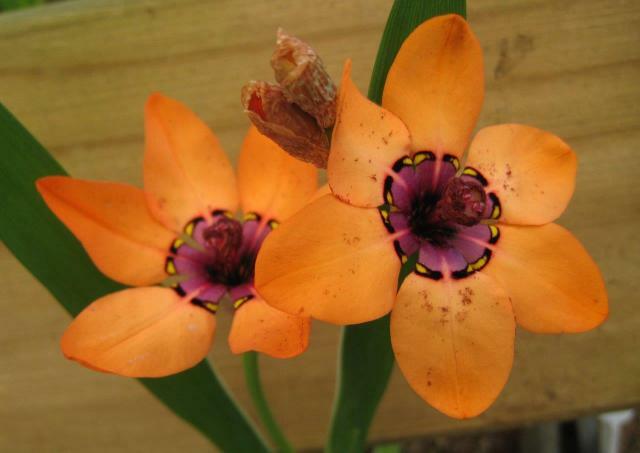 Sparaxis galeata Ker Gawl. , syn. 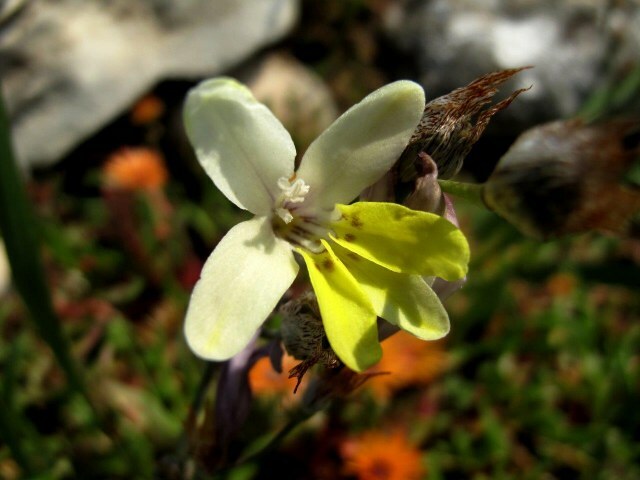 Synnotia galeata (Ker) Sweet, is found on dry stony clay flats and slopes in the Northwest Cape and the Roggeveld. 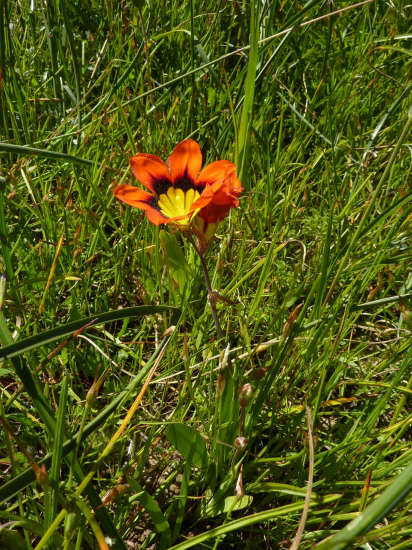 It grows from 12 to 20 cm and flowers from July to mid September. 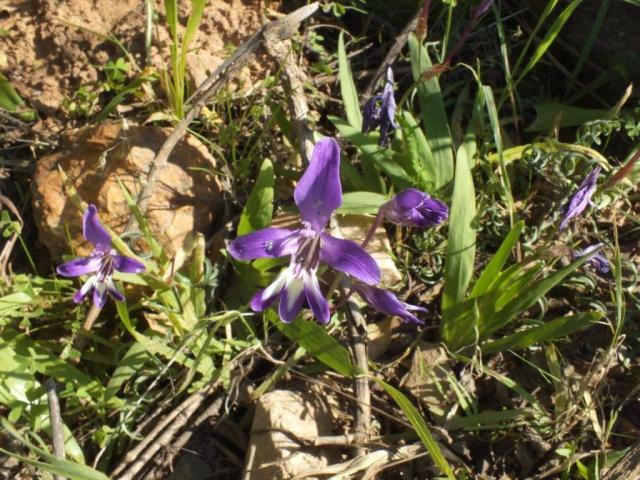 Leaves are lanceolate and usually prostrate or inclined towards the ground with speckled purple on the sheaths. 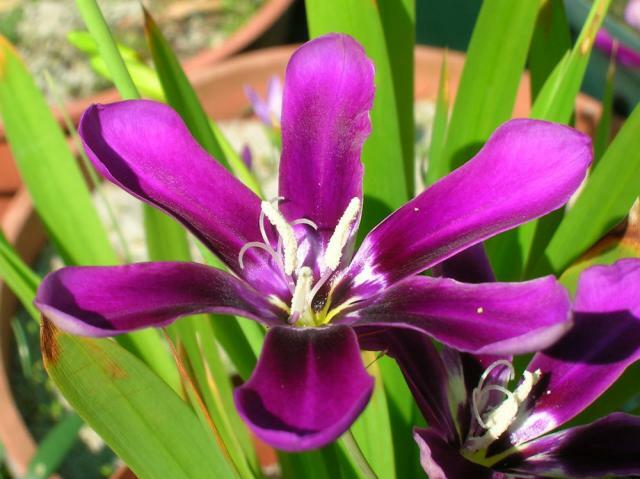 Flowers are short tubed, bilaterally symmetrical and very fragrant (sweetly scented of freesia). 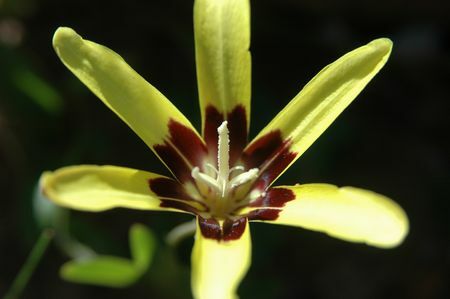 Lower tepals are deep yellow, the uppermost grey purple paling towards the margins and the upper laterals are purple fading to cream; the throat is streaked purple and yellow. 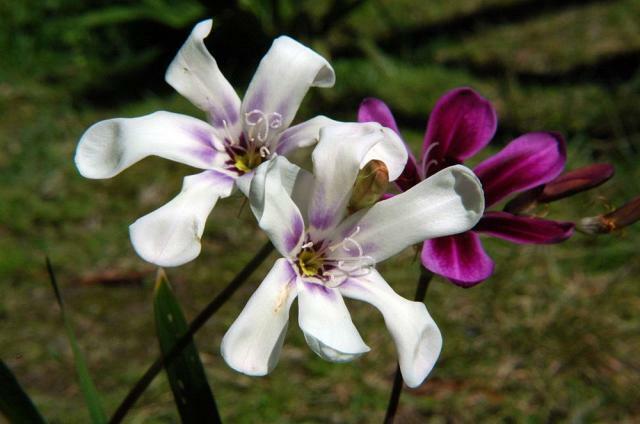 Sparaxis grandiflora Ker Gawl. 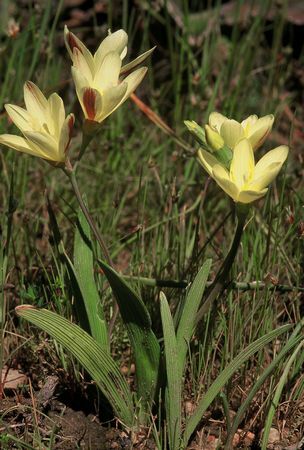 is a species of the Northwest and Southwest Cape where it is usually found on clay flats and slopes in renosterveld, flowering August to September. Four subspecies are recognized. Seed photo by David Pilling. 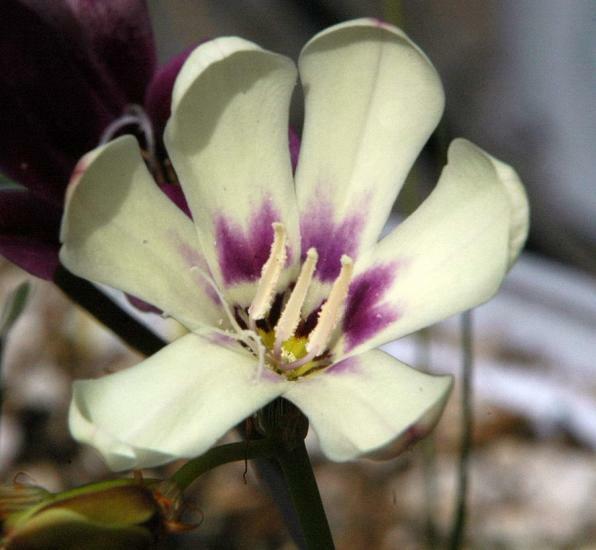 Sparaxis grandiflora ssp. 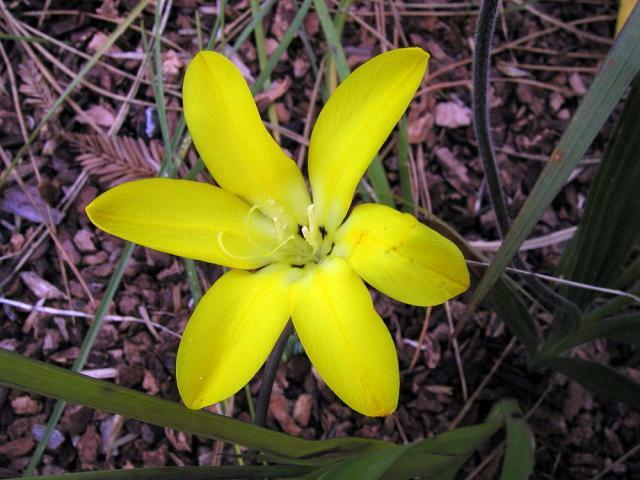 acutiloba Goldblatt is bright yellow, sometimes with dark markings. The tepals are acute. It grows from 8 to 45 cm high. This species is found in the Olifants River Valley. 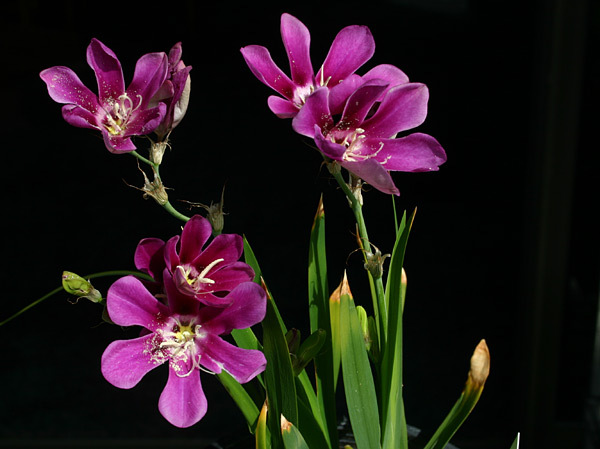 The first two photos by Bob Rutemoeller and Mary Sue Ittner of plants grown from seed. This subspecies has been difficult to maintain in pot culture. The third photo is from Cameron McMaster. The last two photos were taken by Mary Sue Ittner in South Africa in September 2006. 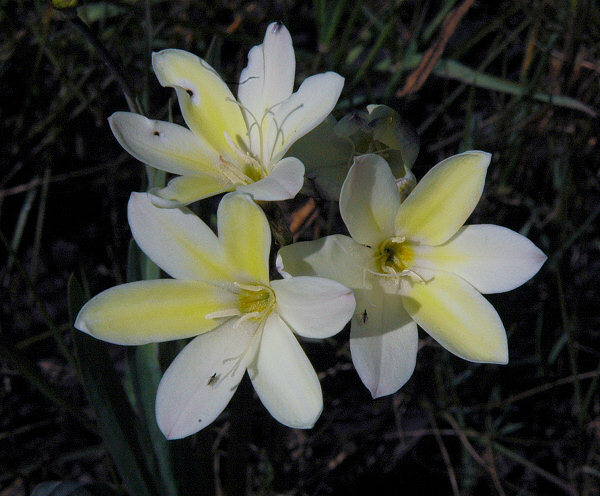 Sparaxis grandiflora ssp. fimbriata (Lam.) 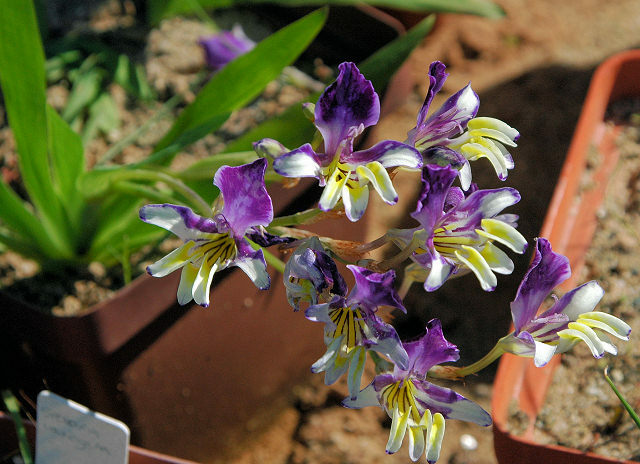 Goldblatt has cream to white flowers with a large black blotch at the base and are flushed purple on the reverse. Tepals are rounded at the tips. 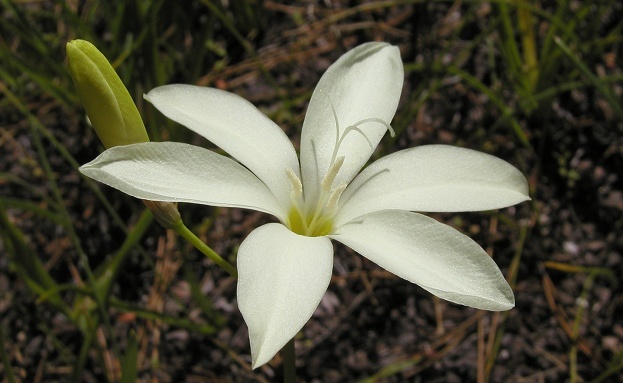 Growing from 18 to 25 cm, this subspecies is found in the southwest Cape. 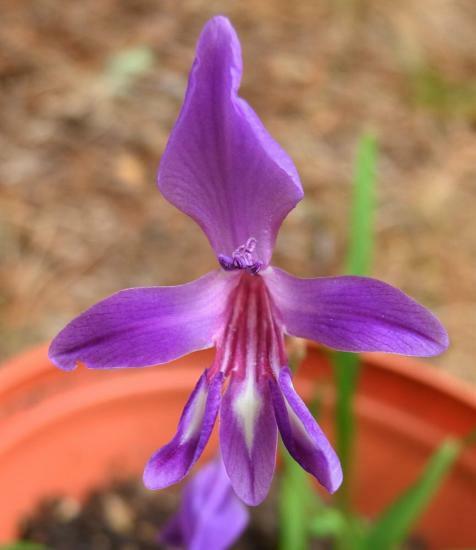 The first two photos from Mary Sue Ittner and Alan Horstmann are of cultivated plants. Photos 3 and 4 were taken September 2006 at Lion's Head in the southwest Cape by Bob Rutemoeller and Mary Sue Ittner. The last photo was taken by Cameron McMaster near Napier in the Overberg. 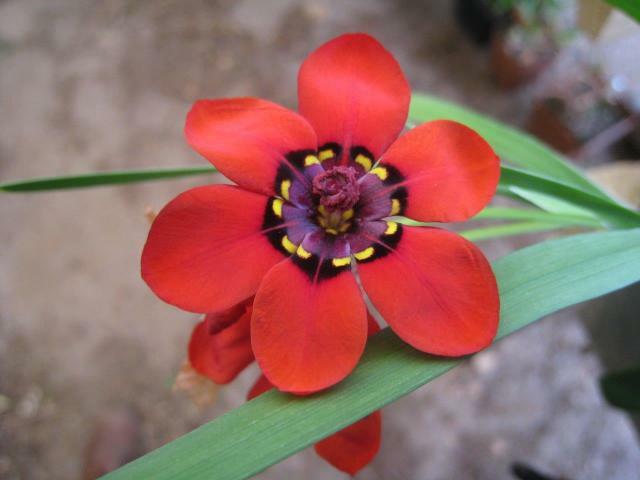 Sparaxis grandiflora (D.Delaroche) Ker Gawl. ssp. 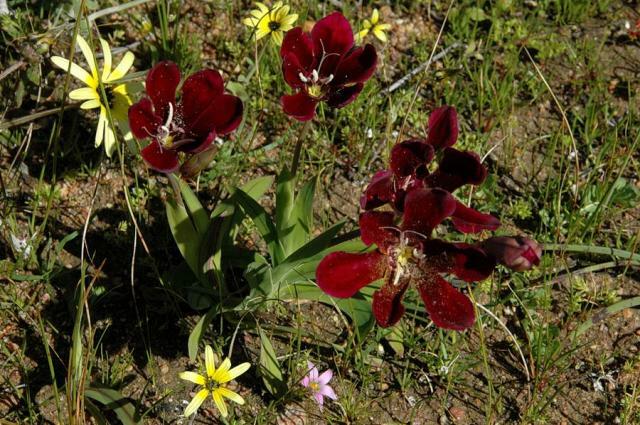 grandiflora is found on seasonally damp or waterlogged clay flats and slopes in shale renosterveld in the Tulbagh Valley in the Western Cape, where it receives winter rainfall. Leaves are lanceolate to falcate and lightly veined. The ovate to spoon shaped flowers with rounded tips are unscented and vary in color from plum-red to white to mauve with a violet reverse; the red form is the most abundant. This subspecies is usually less robust and grows from 10 to 18 cm. For more information consult this South African National Biodiversity article. The Plant List no longer recognizes this subspecies. Photos one and two were taken by Mark Mazer and Bob Werra. Photos below from Mary Sue Ittner show variety in some grown from Silverhill seed and descendants of those plants. 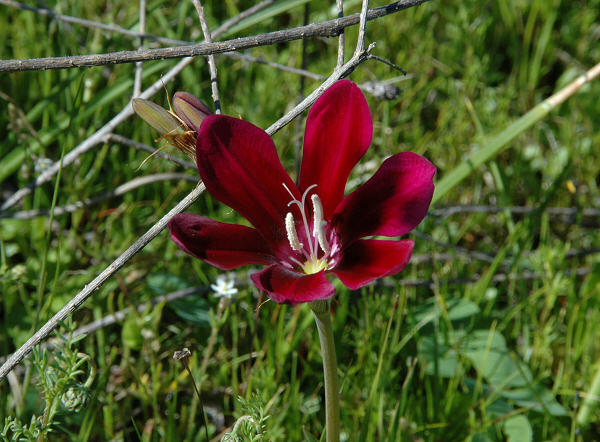 The first three photos below taken near Tulbagh by Bob Rutemoeller and Mary Sue Ittner in August 2006 were taken the same day that Babiana villosa and Geissorhiza inflexa were blooming in the same area. Since they all three are similar in color, one wonders if they share the same pollinator. Monkey beetles are apparently the main pollinator and the flowers serve as a platform both for feeding and mating. The last photo was taken by Alan Horstmann. 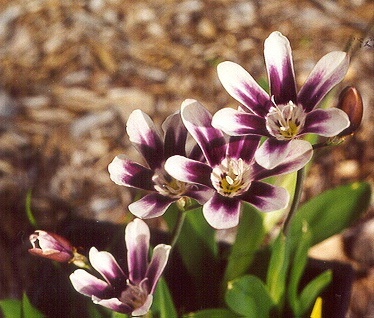 Sparaxis grandiflora ssp. 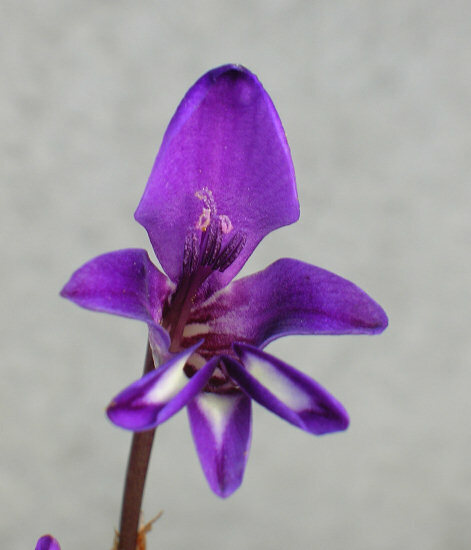 violacea (Eckl.) 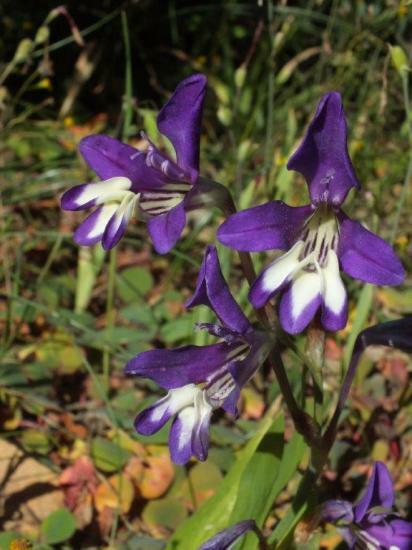 Goldblatt has cream to violet flowers with or without purple markings with spoon shaped tepals with a pointed tip and is found in the Caledon district of the Southwest Cape (Bot River to Bredasdorp). Leaves are broadly falcate and prominently veined. Plants are usually dwarfed, from 8 to 12 cm. The first two photos below were taken by Alan Horstmann and the rest by Mary Sue Ittner including the corms on a 1 cm grid. 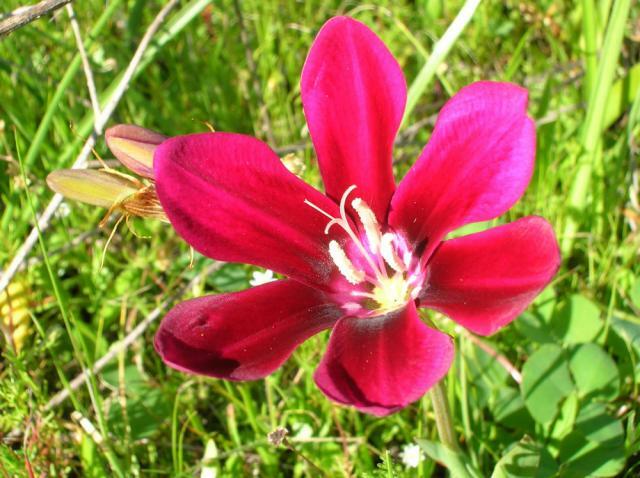 Sparaxis maculosa Goldblatt is critically endangered and is only known from two populations where it occurs on wet clay slopes and flats in renosterveld in the Southwest Cape. 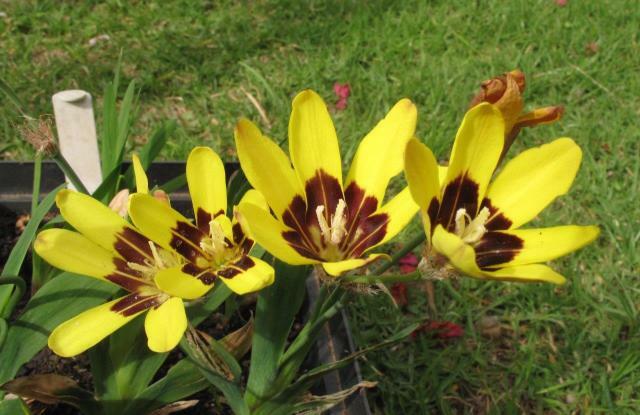 Plants have one to three radially symmetrical bright unscented yellow flowers with a dark maroon-black heart shaped mark with a central yellow streak in the lower third of each tepal. 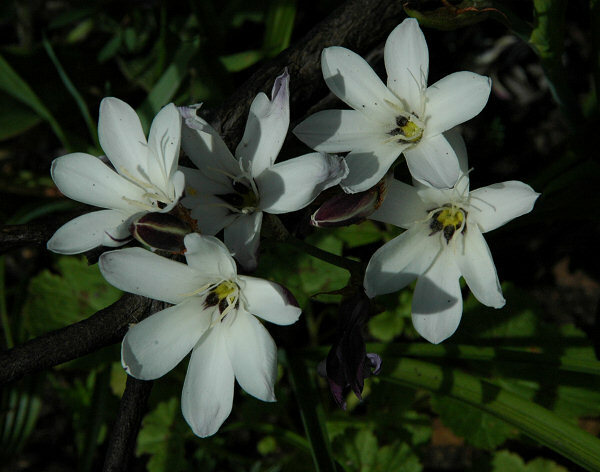 It is similar to Sparaxis fragrans but has larger flowers with the dark central markings and short wider pointed leaves. 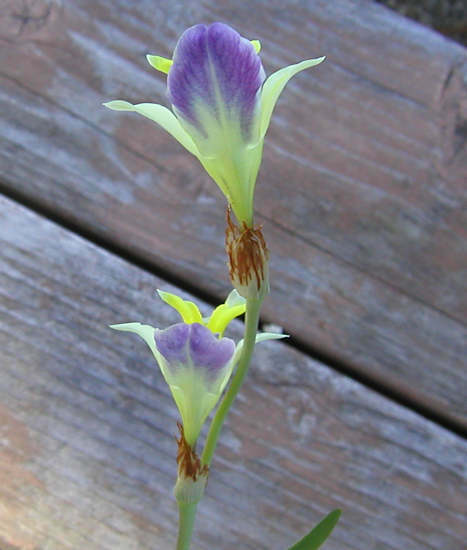 Growing from 10 to 20 cm, this species flowers in September. More information can be found in this link. 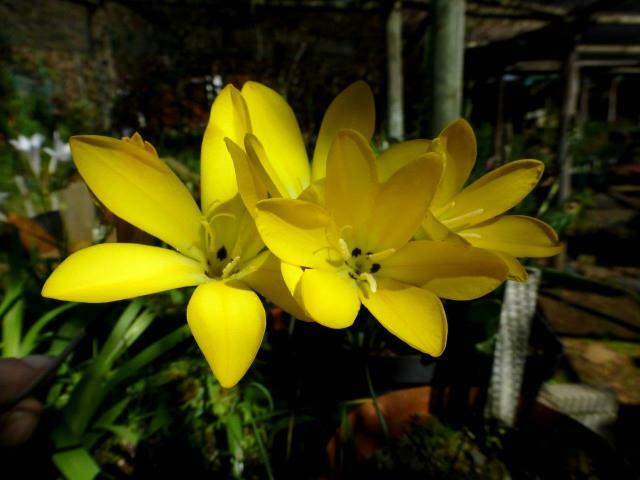 The first photo was taken in the bulb room of the Conservatory in Kirstenbosch National Botanical Garden by Mary Sue Ittner August 2006. The second photo was taken by Cameron McMaster. The last photo from Rod Saunders. 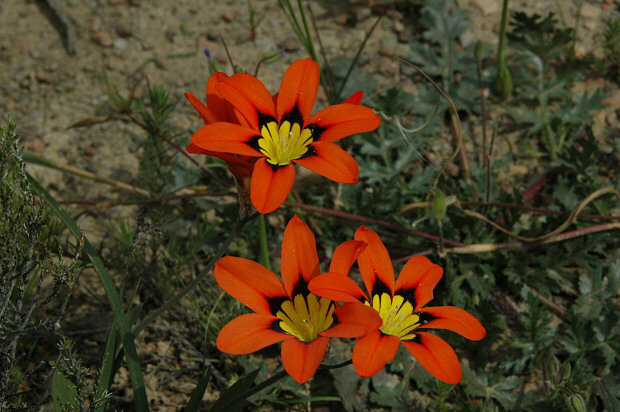 Sparaxis metelerkampiae (L.Bolus) Goldblatt & J.C.Manning (syn. Synnotia metelerkampiae, Synnotia variegata ssp. 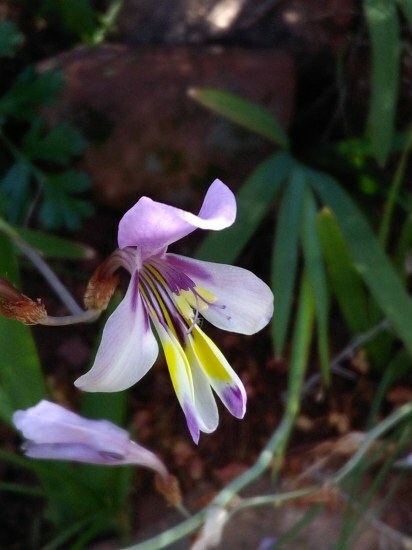 metelerkampiae) is found on rocky sandstone slopes in the Northern and Western Cape. 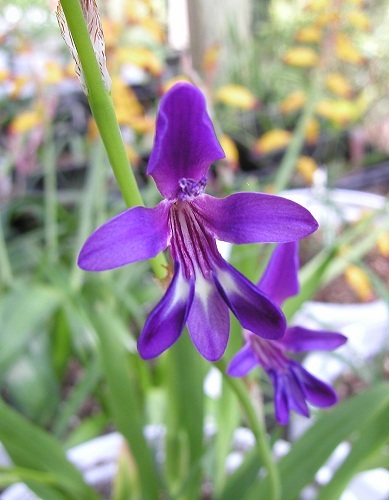 It has bilaterally symmetrical unscented flowers that are purple with white spade shaped marking on the lower tepals. 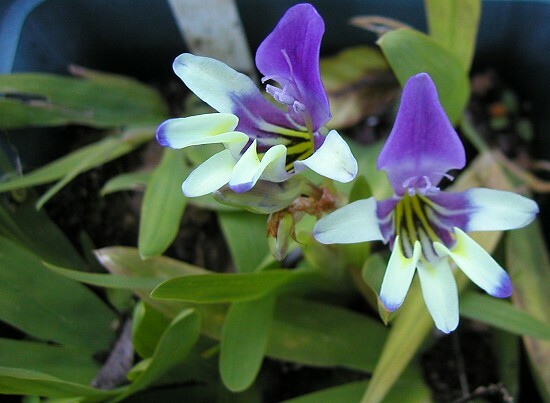 Once considered a subspecies of Sparaxis variegata, it differs in having smaller mostly violet flowers and short purple anthers with tangled style branches. It also has a different pollinator. 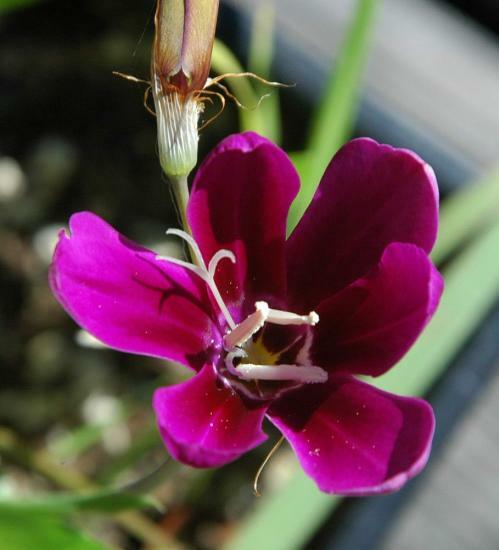 Sparaxis metlerkampiae with its longer sharply bent tube is pollinated by long-proboscid flies and Sparaxis variegata by bees. 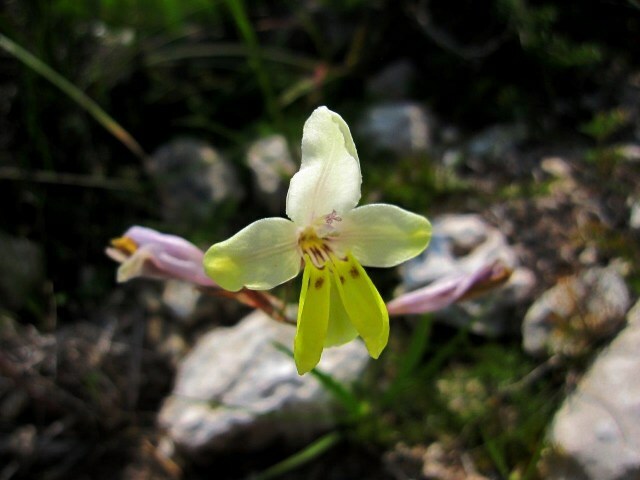 This species grows from 15 to 30 cm and flowers from August to mid September. 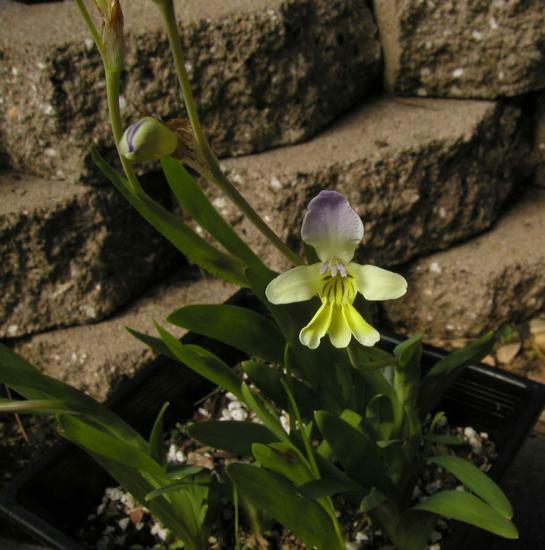 The first photo was taken by Bob Rutemoeller and the second by Alan Horstmann of garden plants. 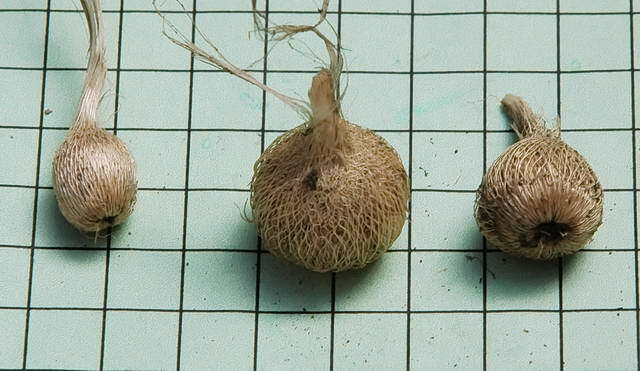 The last three were taken by Mary Sue Ittner including one of corms (round with coarse fibers) on a 1 cm grid. Photos below were taken in habitat. The first from Mary Sue Ittner was taken near Clanwilliam, South Africa, September 2006. The last three were taken by Rod Saunders and Rachel Saunders. 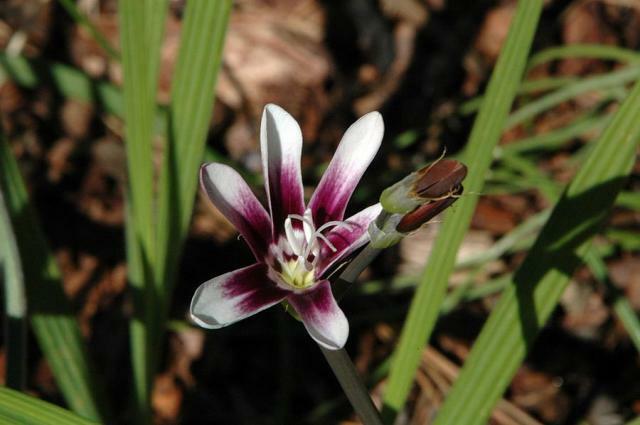 Sparaxis parviflora (G.J.Lewis) Goldblatt (syn. 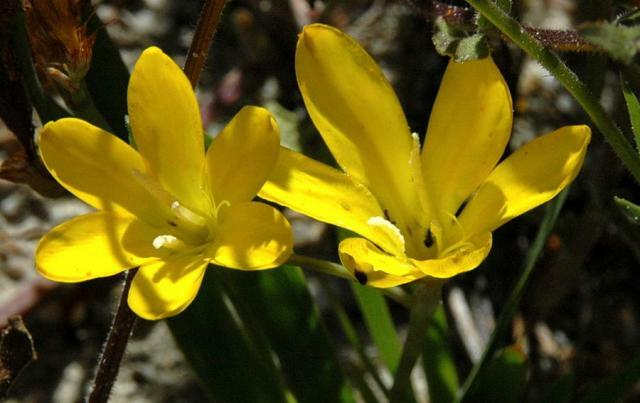 Synnotia parviflora) grows in the coastal plain of the Southwest Cape in sandy, granite derived soils, often in rock outcrops. 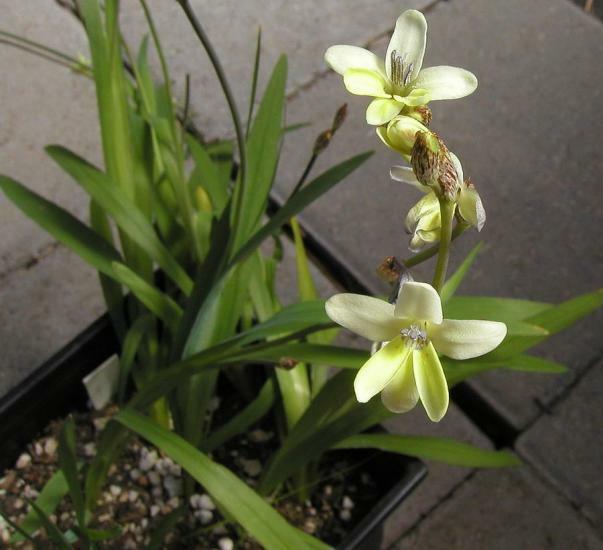 Flowering from mid August to September, this species grows from 12 to 20 cm tall and has bilaterally symmetrical small cream flowers with lemon yellow lateral tepals with dark spots/streaks at the base and a light spicy sweet odor. This species is at risk, currently only in a few locations after extensive habitat loss because of farming and continuing habitat degradation and competition from invasive plants. Photos 1-2 by Mary Sue Ittner. Photo 3 taken in South Africa by Andrew Harvie. 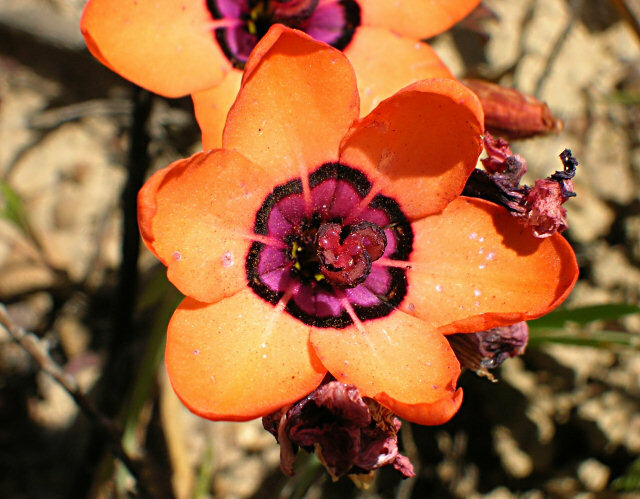 Sparaxis pillansii L.Bolus is native to the Calvinia district of the Northern Cape where it grows in shale and heavy doleritic clay in waterlogged depressions. Plants grow from 25 to 44 cm tall. Flowers are radially symmetrical, rose pink with a yellow center with a yellow heart shaped mark near the base narrowly outlined in dark purple red. 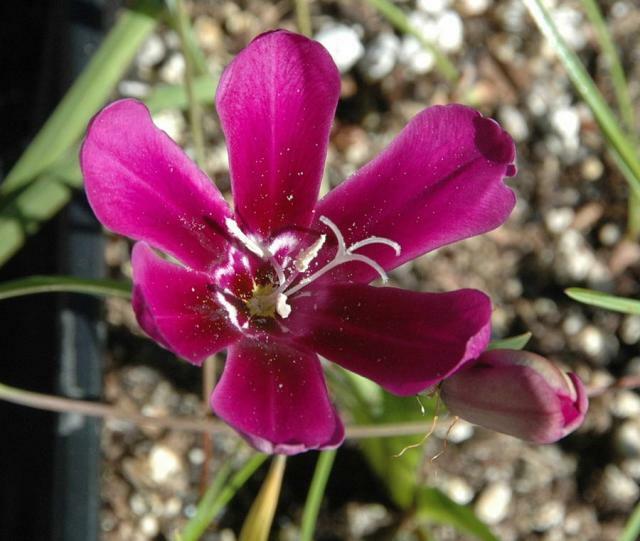 A distinguishing feature are the purple red twisted anthers. 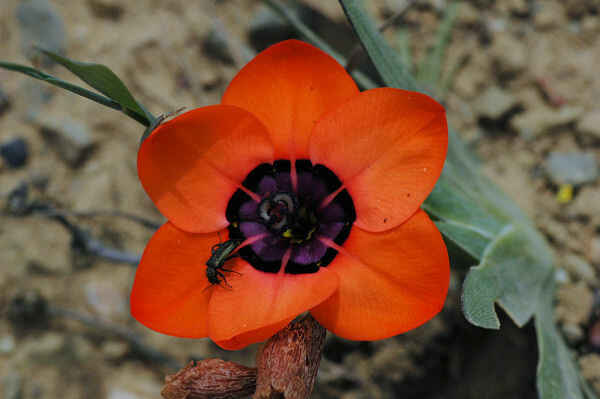 This species flowers from September to late October (spring). The first photo below was contributed by the UC Botanical Garden. The second was taken by Alan Horstmann. 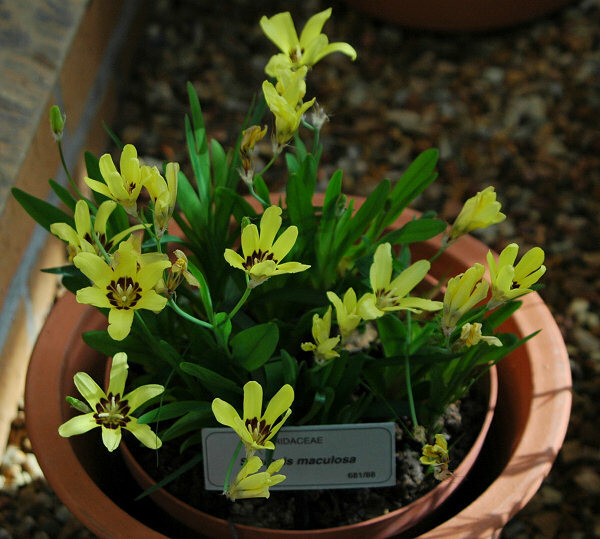 Sparaxis roxburghii (Baker) Goldblatt (syn. 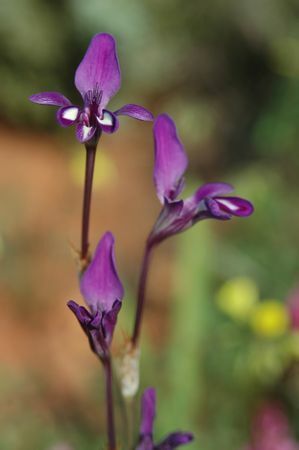 Synnotia roxburghii) grows on rocky sandstone slopes in the Olifants River Valley. It is extremely rare and is known from only one population in the middle of fruit orchards and is declining. 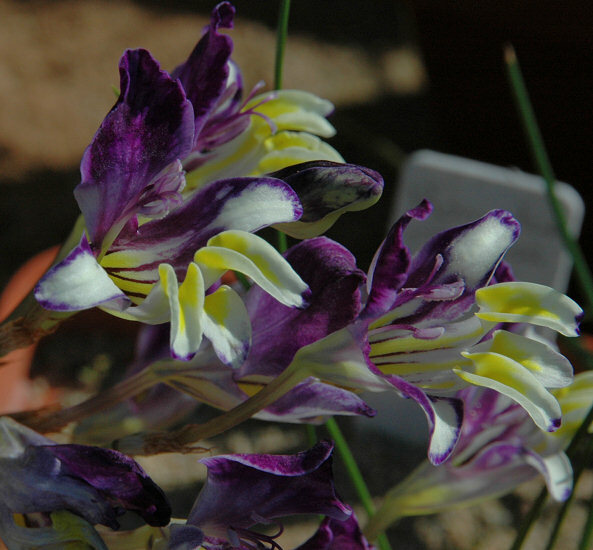 It has bilaterally symmetrical mauve to lilac flowers with yellow on the two thirds to lower half of the lower tepals. The throat is yellow with dark streaks. The perianth tube is obliquely funnel-shaped, 20-30 mm long. 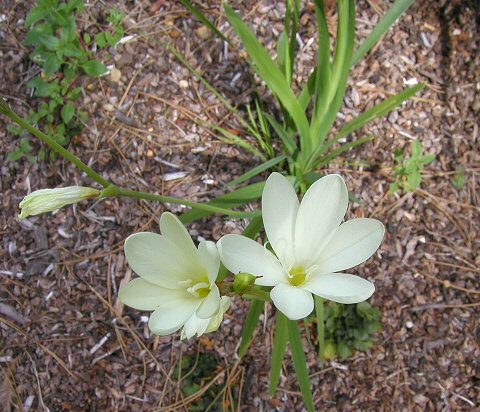 It is distinguished by its long-tubed flowers and the finely fibrous corm tunics that extend upwards in a neck around the leaf bases. 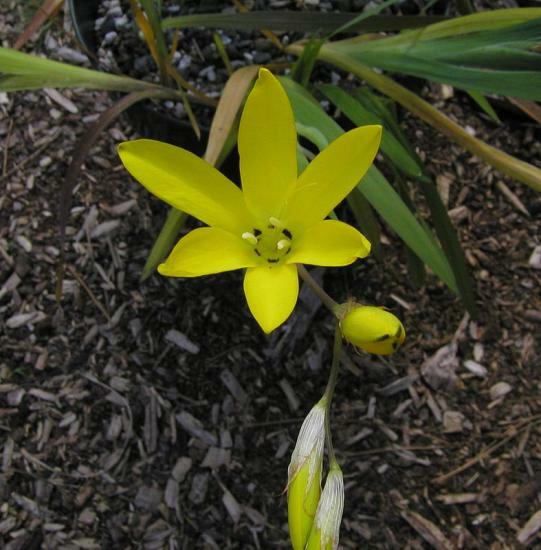 Growing from 28 to 45 cm, it flowers late August to mid September. 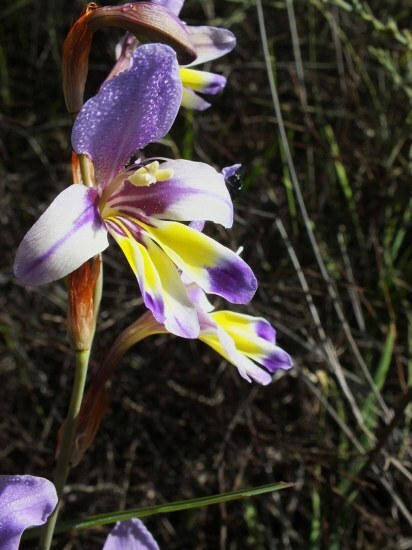 Photos taken by Rachel Saunders of plants growing in partial shade in old fynbos and almost 60 cm high. 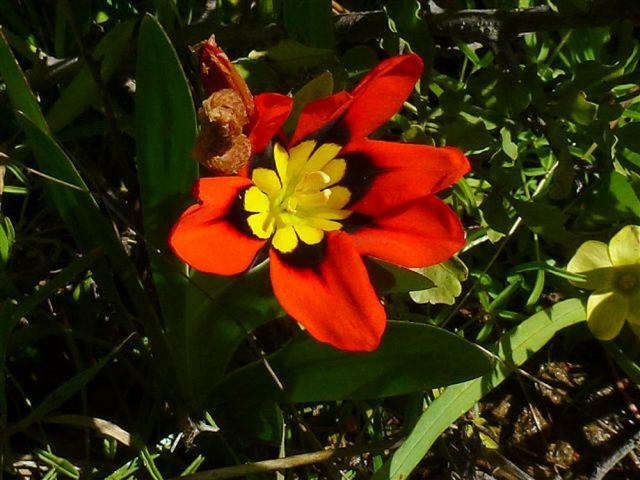 Sparaxis tricolor (Schneev.) Ker Gawl. 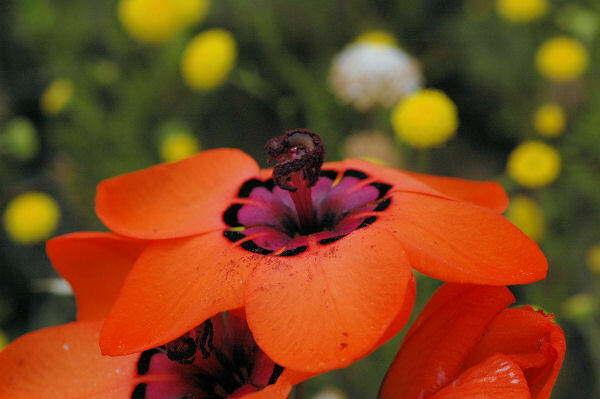 has orange scarlet flowers with a yellow center edged with reddish black. 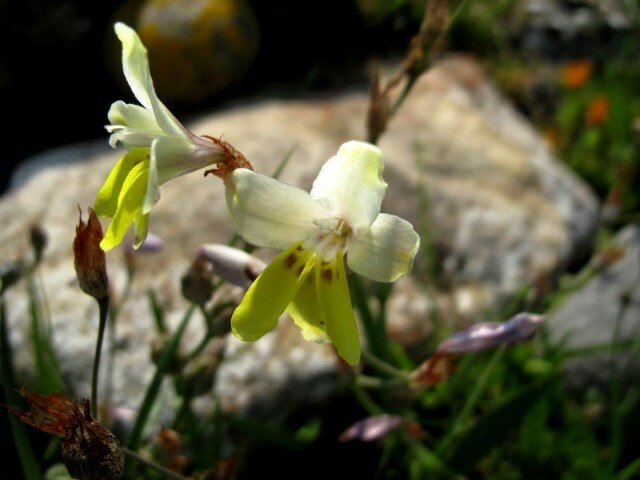 It grows on damp clay and stony soils in renosterveld in the northwest Cape and flowers September to October (spring). 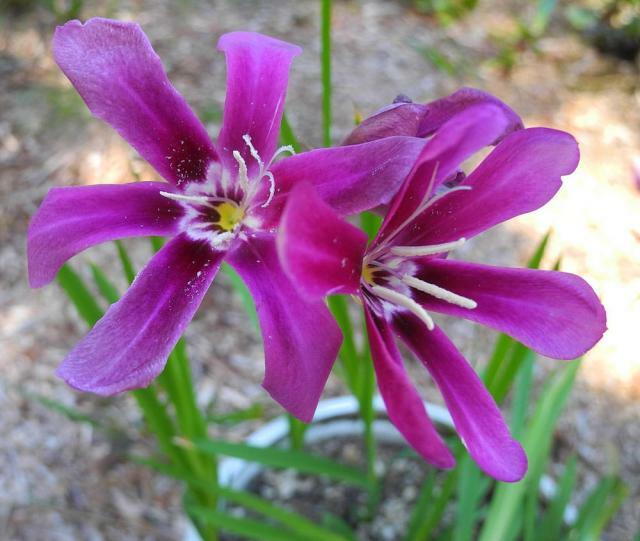 It is one of the species used in hybridizing and is widely cultivated. 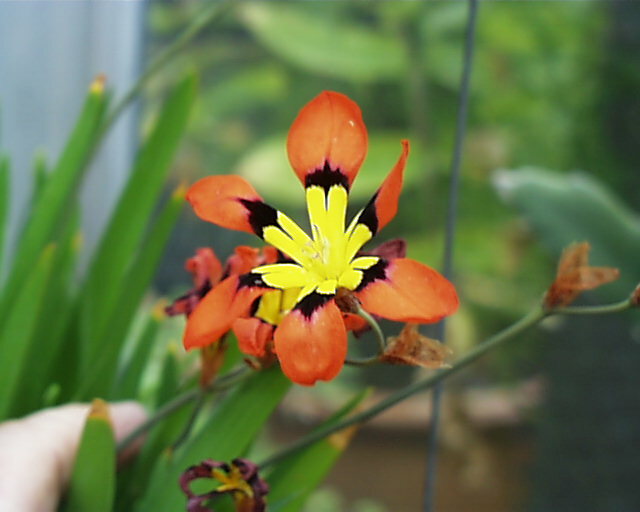 Growing from 12 to 30 cm, it is very similar to Sparaxis pillansii, but differs in flower color and in having anthers that are not twisted and and yellow to ochre. The first photo was taken by Arnold Trachtenberg at Wave Hill and the next two by Mary Sue Ittner including the corms on a 1 cm grid. 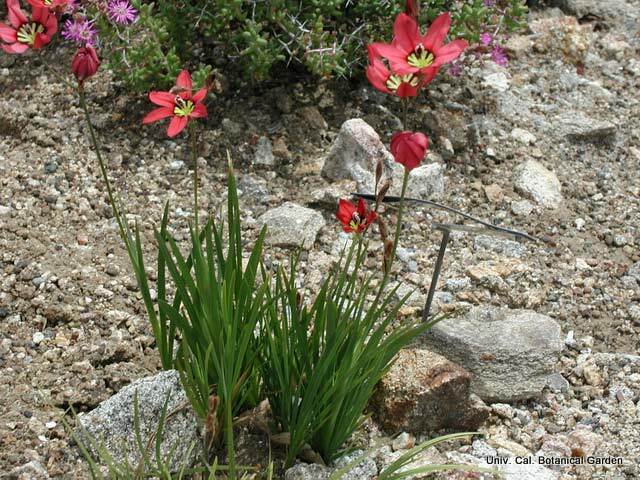 Photos 1 to 3 taken by Mary Sue Ittner and Bob Rutemoeller are of plants seen flowering in Nieuwoudtville September 2006. 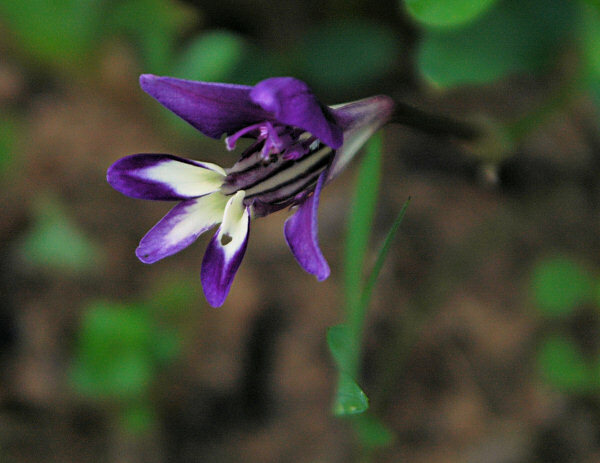 Photos include a close-up with a beetle pollinator and the last shown with Lapeirousia jacquinii. The last two photos were taken by Cameron McMaster near Nieuwoudtville September 2011. 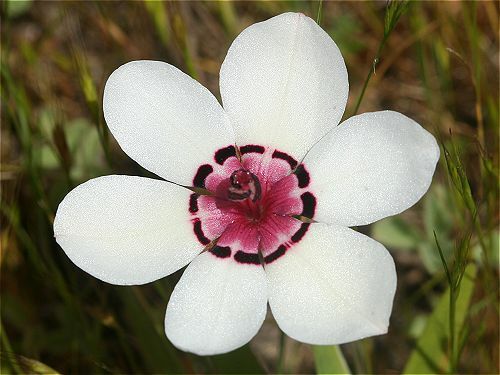 Sparaxis variegata (Sweet) Goldblatt (syn. 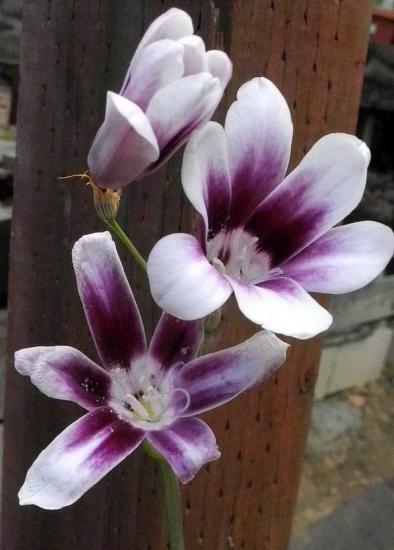 Synnotia variegata) has trumpet shaped bilaterally symmetrical flowers with a long bent tube, purple upper tepal, and cream colored other tepals. The lower laterals are yellow in the middle of the lower half and tipped purple, the upper laterals are purple below and the throat is lined yellow and purple. 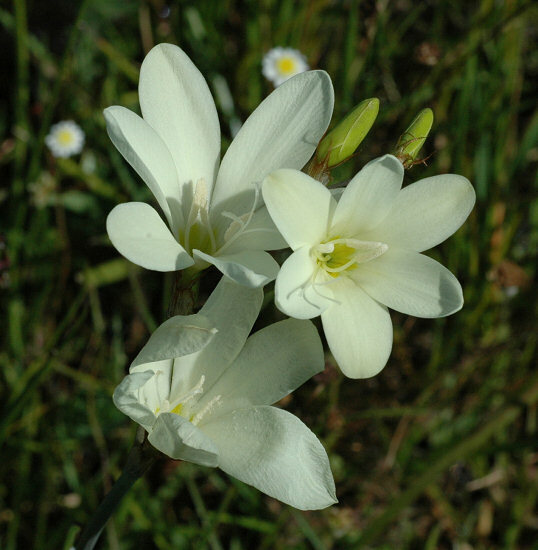 Anthers are whitish. Corms are distinctive: the coarsely fibrous corm tunics are thickened into claw-like ribs below. 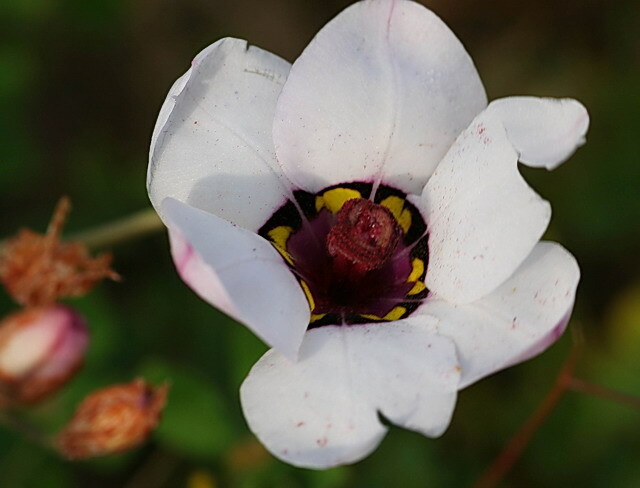 This species grows from 10 to 18 cm (and sometimes more) and is found on rocky sandstone slopes in the northwest Cape (Olifants River valley and mountains north of Clanwilliam) and flowers late winter-early spring (August to mid September). The first two photos were taken in the Karoo Desert NBG in August 2006 by Bob Rutemoeller and Mary Sue Ittner. There was a color break in the flowers. Could they be virused? 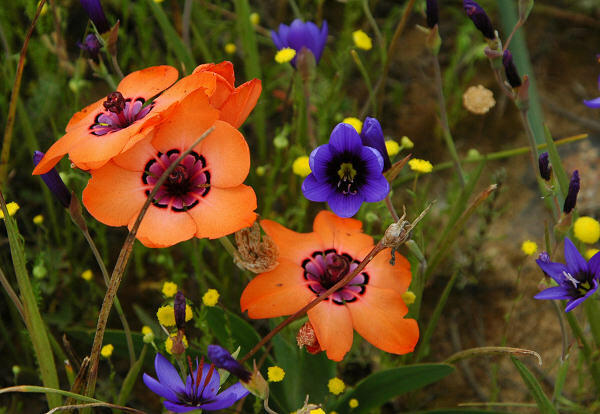 The last photo below was taken by Bob Rutemoeller of plants grown by Rachel Saunders and Rod Saunders in South Africa (blooming September 2003). 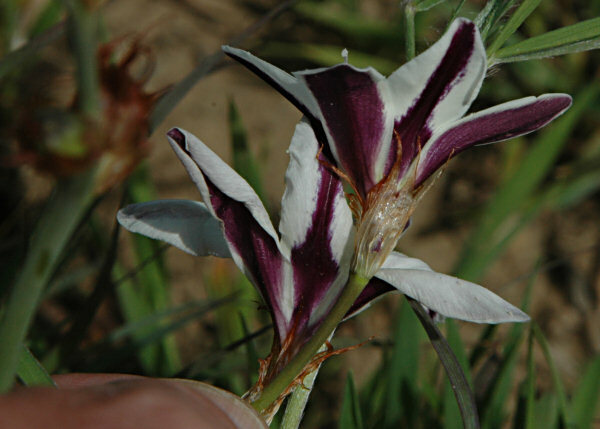 This picture has previously been identified on the wiki as Sparaxis variegata and then was changed to be S. roxburghii, but now John Manning has confirmed that the original identification was accurate. 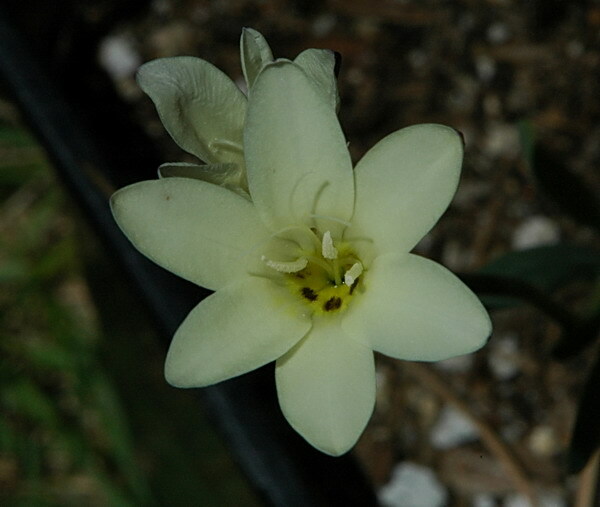 Sparaxis villosa (Burm.f.) Goldblatt (syn. 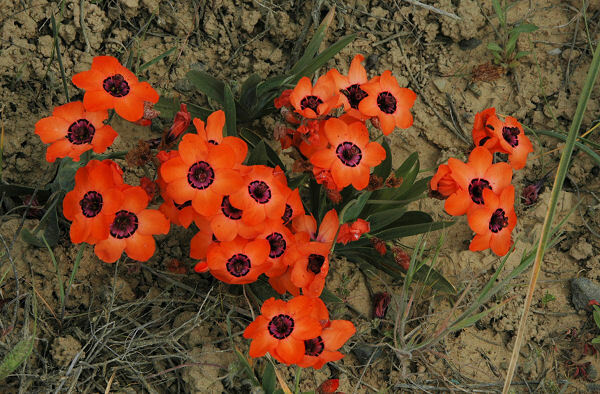 Synnotia villosa) is found growing on clay and granite slopes in the northwest and southwest Cape. 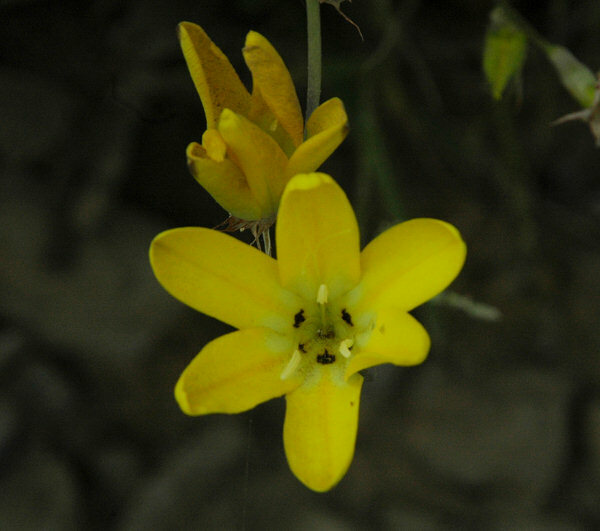 It has small cream to yellow bilaterally symmetrical flowers. 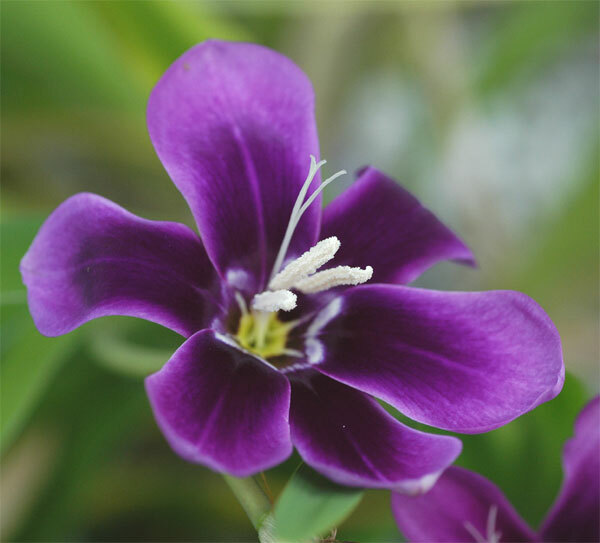 The hooded top segment is flushed violet. Corms are coarsely fibrous and thickened below into vertical claw-like ribs. Growing from 15 to 35 cm, it flowers mid August to late September. Photos by Bob Rutemoeller and Mary Sue Ittner. 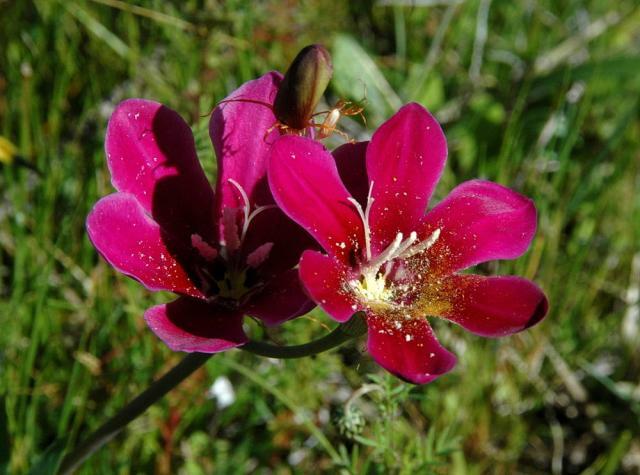 The last photo was taken near Tulbagh with a beetle pollinator.